As they walked through the huge airport, I had a case which had me worried, during the movement, I went to the toilet and the guys said wait for me, but when I got out, saw his delegation, which had already left and did not wait for me. My English slices from perfect and approaching the information Desk, I began to recall all I know of English words to explain and figure out how to get to the domestic check-in flights, and suddenly I heard someone Testament and saw his friend Andrey Malanichev who noticed that I’m not there he panicked and ran to find me, I’ve been very grateful for your concern. And finally we arrived in the airport of Miami, where output has already met us caring organizers of the world championship, sitting in a comfortable bus we headed to the hotel where on arrival successfully settled. By chance, the XXXV world championship for men was held in Miami United States almost immediately after hurricane Katrina, which caused enormous damage. The authorities were mostly concerned with the elimination of consequences of elements, so the organization of the competition this time they were interested to a lesser degree. Yes, we may not claim as your own eyes have seen countless destruction at every turn. In tall buildings the Windows were blocked with plywood. Mutilated monuments of culture. Old trees with huge roots defiantly lying on the ground. It is unusual to see tall palm trees without leaves and without tops: some trunks. The sight was unpleasant. But despite all this, the world championship for men was held. The organizers were able to create good conditions for the athletes. Put all the contestants in fine hotels the 4-star “Hyatt Regency Miami”, which adjoins the Miami Convention Center, which hosted the XXXV world championship for men. It was very convenient for athletes and coaches, as there was no need to move anywhere and to go far. We were pleased with the organization and conduct of the championship. For me this world championship was a jubilee. Winning it, I became the tenfold champion of the world. Abandoning the World Games in Germany, basic training was aimed at the championship in Miami. The organizers in connection with the holding of the next Congress of the Federation of powerlifting, has pushed back the timing of the competition and we had time to see the sights of this great and world famous city of Miami. The first thing my friend Andrey Malanichev went to the car rental and rented a Chrysler for the seven seats make it convenient to carry our boys on the national team. Execute all necessary documents, I got behind the wheel and we with Andrey have gone to the beach Miami beach. The weather was good 25 degrees Celsius. Swam in the ocean, we went over our friends and after one hour we had 5 people, these names are known to the world of powerlifting, these are my friends Andrey Tarasenko, Mikhail Andryukhin, Victor Furachkin, Nikolay Suslov and Andrey Malanichev. After some time brought a few more people, so the whole day we shuttled from the hotel to the beach and back was great. The next day we went on a tour in one of the most famous Miami attractions, zoo. It belongs to the major zoos in America: on the territory of about 300 hectares, there are about 2000 different species. The conditions as close to natural due to the warm climate. Here you can see the fauna of Africa, Asia and America. Because of the huge size of the zoo on foot to explore the whole territory in a few hours is impossible. Therefore here suggested to use the services of the monorail and ride in a comfortable van or to rent a Bicycle, which we did, really enjoyed it. Thinking about where to go in Miami, a must-have item in our entertainment was the Aquarium. Here you can see the most unusual inhabitants of the ocean: sharks, eels, turtles giant size. The highlight of the aquarium is a colourful performance of dolphins, sea lions and orcas. 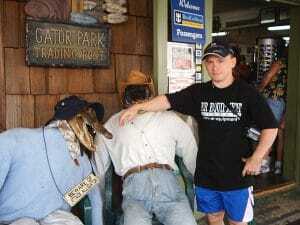 The next morning another day my friends, Andrey Tarasenko and Mikhail Andryukhin went to Gator Park, ride with the wind through the swamps of Florida, looked at the show with alligators, looked at the exotic birds was very interesting, then a good mood and positive emotions went to the hotel. 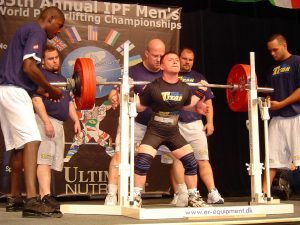 And then came the day of the competition, made quite smooth, showing the result in squats 250 pounds, bench press of 175 pounds and deadlift 220 pounds and the sum of 645 pounds, winning thus the tenth world championship, second place went to American Holloway Domarrio “Doc” with the result in the amount of 615 pounds, and third place veteran world powerlifting Japanese Isagawa Hiroyuki with a score of 615 pounds and lost weight were heavier opponent at 200 grams. Later in the week lasted world championship and my friends and helped his teammates in their speech. 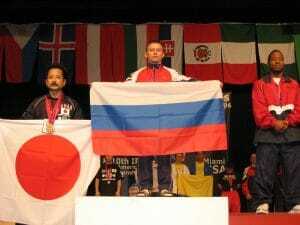 The Russian team then won the XXXV world championship. Helped me outfit from the firm Titan, big thanks to Pete Alaniz for the provided equipment. 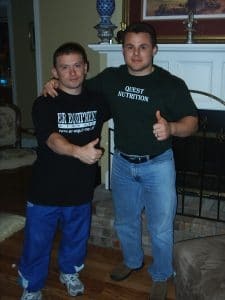 After his performance at the championship, my friend Wade Hooper who took second place in the weight category of 75 kg and his wife Kim Hooper, offered to go to visit them in New Orleans, who had just suffered a hurricane which killed 1000 people, of course I agreed, I was interested to touch the lives of Americans. From Miami we flew separately, we with Kim on the same plane, here’s Wade on the other, it must have been for the sake of security. Arriving in New Orleans we went home on different machines, each on their own, which for me was also amazing, we in Russia very few people have two cars. While driving on the way home, I saw the aftermath of hurricane destroyed houses which were restored, there was a large construction project. I first saw the famous bridge with a length of 38 kilometers and the Mississippi river. Once home, we were in a rented apartment, which the family Hooper removed temporarily because they were doing repairs in the purchased after hurricane house, I must say that real estate prices have fallen twice. Leaving everything at home, we went to visit my mom Kim, where he spent a lovely evening at dinner. In the morning after Breakfast, I went to work for Wade, in the school where I am well accepted and showed how American children learn, it was very interesting, as it is a big difference between schools in Russia and comfort for students. The language barrier has helped us overcome translator, Russian boy named Basil who lives in America уже15 years after the tragedy of the hurricane, lost his job and for remuneration agreed to be a translator, we could communicate well. We also went on excursions to different places was very interesting. At home, I decided to cook a dish that we in Russia are very fond of this rice, came to the supermarket, we bought groceries and went to cook. Dish, family liked Hooper. I was surprised by the presence of two washing machines, one of which I’m told Hooper, erase the shoes, and the second linen, it was amazing, because we have in Russia, not all have even one washing machine (it’s a joke). And now it’s time to fly back to Miami, where I was waiting for my coach Igor Derevyanko and friend Andrey Malanichev, as I decided to stay in Miami longer, than Russian national team in powerlifting. Saying goodbye and thanking the family of Hooper, I was flying. This trip is the most memorable in my sports history because it’s full of events and impressions, I am grateful to all who participated in it. I had time to go back in the many areas of Miami, it was great. Then I’ll write about the second trip to America, which took place five years later in 2010 it was the world championship for bench press in Killeen. Sincerely yours, Konstantin Pavlov from Russia. 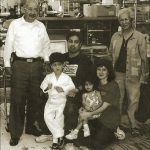 Путешествие по Америке 2005 год. Путешествие по Америке часть вторая 2010 год.